This new module sounds stunning, with that authentic Obie tone, and can add additional voices to your OB-6. The sound and build quality are top-notch. You can't poly-chain the OB-6 with the P6 or vice versa. We recently-reviewed DSI's new desktop-version of the Prophet-6, and now we're looking at the other keyboard classic to get a desktop makeover - the OB-6. The ethos with the OB-6 (and P6) is putting all the sound-shaping power directly under your fingertips, so pretty much every function has a dedicated knob/switch and there are no menus - just a basic three-digit LED to display patch numbers and various global functions. The most important thing is that the sound is still hugely inspiring and engaging and few other current synths can touch its upfront, clear-cut yet earthy sound! The quality of the oscs is right up there with the best and it's rich, creamy, gooey, sizzly and deep with virtually no background noise in the signal path. Warm-up time is fast and tuning very stable once you've calibrated the oscs a few times in different temperatures. The envelopes are punchy and very detailed sounding and the effects transform the sounds beautifully, placing them into many varied, yet always musically relevant contexts. Build quality is holding up great with everything still feeling and looking like new and DSI have also updated the OS regularly, with the latest update bringing several new velocity curves which have improved playability greatly. The 'downsides' we've found are minor. Since the P6 launched, other analogue polys have entered the market with more comprehensive mod facilities, so the P6/OB-6 do look a little basic in terms of modulation facilities/control, especially considering their price. For example, you can't control either modules' effects via a mod wheel, aftertouch or a pedal (as you can on the upcoming Behringer DeepMind 12 or on a Roland JD-XA). TheObie oscillators/2-pole filter deliver distinctive, edgy sounds which make the OB-6 stand out in any track/mix. The OB-6 module is built into the same size desktop enclosure as the P6 but with the styling, features, sound engine and knobs taken directly from the OB-6 keyboard. If you're after the poly-Oberheim sound, then the OB-6 module is currently the cheapest way to get a 6-voice poly happening, otherwise it's down to buying an old Obie or linking several SEM modules together which would be way more costly (as they are around 1,400 euros each for a single voice SEM-Pro). So the OB-6 module (while still a significant outlay) is the most affordable current option for the polyphonic Obie sound. 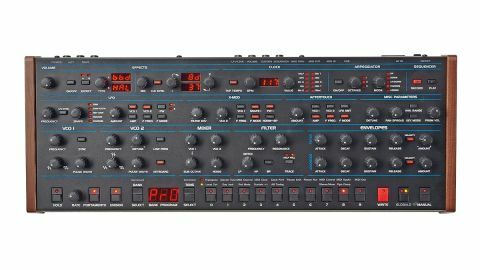 Yes, it's a more modern/refined Obie sound than the Two Voice Pro we recently reviewed but with six voices, patch memory, a poly-sequencer and arp, plus the dual effect engines, it's a very well-thought-out, nicely-specified and great-sounding machine that's hard to argue with! It does sound gorgeous and significantly different to the P6 and P6 module, with the main differences being the slightly more drifty sounding oscillators, the square wave sub-oscillator and, more importantly, the distinctive state- variable 2-pole SEM-based, non-self oscillating filter which sounds juicy, gnarly and wiry, with a resonance control that can be pushed to maximum without losing too much low-end power. One of the biggest appeals of this new module (apart from the size and price) is the ability for existing OB-6 owners to add a further six voices easily with just a MIDI cable. This is a significant extra expense but once you hear a 12-voice OB-6 (layered or poly-chained) it's very hard not to cave in if you have the cash and, if not, once you've had a taste you might have to sell something else to fund it! To set up an OB-6 with the module version, connect the keyboard's MIDI out to MIDI in on the module, set the keyboard mode to BTH (both) for layering or PLY (poly) for poly-chaining and you're set (just be sure to match your patches on each unit first). All voices will be divided up smoothly between the keyboard/ module. Having either of these synths playing 12-voice poly-patches is an inspiring experience, though it would be great if eventually DSI made an all-in-one 12-voice version of either of these synths with additional mod facilities. For now though, the keyboard plus module is a great solution to this pipedream! To conclude, the Obie oscillators/2-pole filter deliver distinctive, edgy sounds which make the OB-6 stand out in any track/mix. There's very little to fault here and this module will have you grinning from ear to ear like a Cheshire cat. Great stuff again!